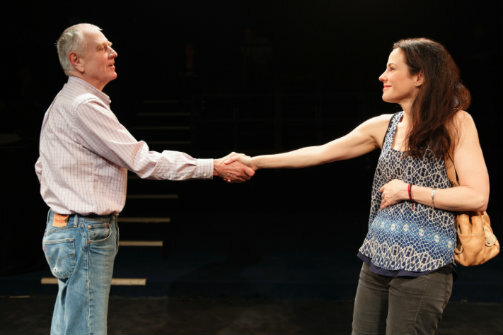 Dennis Arndt and Mary-Louise Parker in Heisenberg. Photo by Joan Marcus. BOTTOM LINE: A middle-aged woman seduces an older man in this exploration of love, aging, and deception. “Do you find me exhausting but captivating?” In Heisenberg, produced by Manhattan Theater Club and now playing at New York City Center, the forty-something Georgie asks this of her prospective septuagenarian beau, Alex. However, playwright Simon Stephens may as well be asking the same question of his audience. Fresh off the enormous success of his immersive The Curious Incident of the Dog in the Night-Time, now playing on Broadway (A Theasy "Best Bet"- review here), Stephens scales back, well, everything for this minimalist two-hander. When Georgie (an uncharacteristically over-the-top Mary-Louise Parker) kisses the unassuming Alex (a strong Denis Arndt) on the neck in a London train station, the two strike up an awkward conversation. Perhaps it would be more accurate to say that Georgie strikes up a conversation with herself, as Alex, though entranced from the start by her beauty, adds little to their early exchange. The much older Alex eventually grows tired of Georgie’s antics and leaves, potentially walking out on her forever. However, as we might have guessed, Georgie is nothing if not persistent- she ambushes Alex at his job and convinces him to take her to dinner. From there, the two become a couple of sorts… at least until the depth of Georgie’s deception is made known. Heisenberg’s title comes not from Breaking Bad, as some millennials may reflexively assume, but from Heisenberg’s principle of uncertainty, which states that it is impossible to simultaneously know both the exact position and the exact speed of an object. The principle is only explicitly referenced once in the play (unsurprisingly, by Georgie, who does most of the talking), but its ethos provides a structure for the work as a whole. Heisenberg’s principle exists because, as this helpful TEDEd video explains, everything in the universe acts as both a particle and a wave. Particles (such as protons and electrons) exist in a single location at any given instant in time. This is Alex- a creature of habit who walks an hour and a half to work every day and likes to listen to music in the park. Waves, by contrast, are disturbances spread out in space. This is Georgie- a jumble of unpredictable speech and intentions that seems shot out of a cannon. When they collide, it is impossible to simultaneously tell where their relationship is, where it is headed, and how quickly it will get there. Unfortunately, Heisenberg does not commit fully to exploring the volatility of this collision. Though there are moments of genuine vulnerability (the “first date” comes to mind- a conversation over dinner during which Alex bares his soul), the play seems more concerned with Georgie’s shallow, verbose deflections. She functions as a middle-aged manic pixie dream girl- convincing enough in her eccentricity and availability to win the stoic Alex’s affection. Though she reveals her deceitful nature almost immediately, her energy is sufficiently infectious to eclipse her duplicitousness- Alex just wants to be around her, damn the consequences. And what are the consequences, really? Alex, shunned in his youth by the only woman he ever loved, has little to look forward to but death. He has no relatives (save his dead sister, who speaks to him throughout the play), and his butcher shop is on the verge of closing. When the über-spontaneous Georgie comes into his life, whatever her motives, he sees in her the opportunity for human contact in a way that he thought he might never have again. In her role, however overwritten and inauthentic, the usually understated Parker shines. Those who know her as the in-control-until-she’s-not Nancy Botwin from Weeds will be surprised to see her take off the governor and explore her childlike enthusiasm. In performance, if not in writing, this contrasts well with the impressive Arndt, an actor who justifies his character’s wildly irrational decisions concerning his youthful paramour. Like its namesake’s famous principle, Heisenberg is full of uncertainty. Can love transcend generations? When is it safe to trust someone? Will Georgie ever stop talking? Though the answer to the latter is clear (no), some aspects of the piece linger long after the lights go down. Older theatergoers will likely relate more to the play’s big questions than their younger counterparts – there is simply not enough dramatic action to please the Snapchat generation – but the actors elevate the script to something watchable. Ultimately, Heisenberg is certainly exhausting, but I wish it were just a little more captivating.